Tell me another story, Grandpa Guy – Some thoughts on the stories of our lives. 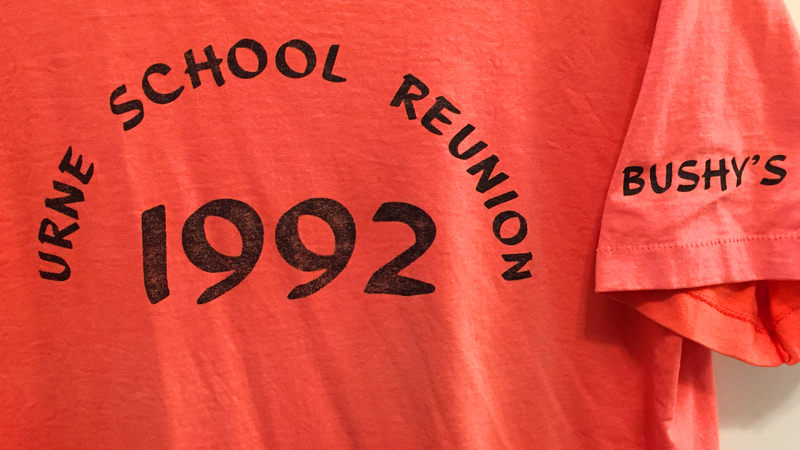 In this brief story, Esther covers only the grade school days. When Esther told us stories about the pictures in Grace’s picture album, this picture triggered a lengthy discussion about life in Steele, where the kids went to high school. Not many parents today would do what Fanny and Ted did for their kids. The township grade school near the farm only went through grade eight. If you wanted more school, it was off to Steele for high school. Though only thirty or forty miles from the farm, that was far enough that the kids had to rent a room in town, staying there during the week, coming home only for the weekends. In the winter, travel would be with horse and sleigh, and sometimes road closures meant weeks would go by without a trip home. Henry went to high school only one year. He didn’t like it; didn’t fit in well. Esther thrived. The first year Esther was away at school the onset of winter was brutal, which meant she didn’t get home for six weeks. Surviving that extreme case of homesickness hardened her to never be bothered being away from home again. Melvin joined her the next year and they rented a light housekeeping room from the Goettertz (pronounced Gott-hard) family in town. Henry built a little table for them, they had orange crates for cupboards and a single burner hot plate to cook on. There was no running water, they carried everything to the room in a bucket; out in a slop pail. Rent was ten dollars a month. After that Bruce Bowerman joined Esther and Melvin, the boys were fourteen and Esther was only 16, but she did all the cooking and cleaning. Fried eggs with bread and butter every morning for breakfast. All without running water, on a hot plate. By the time Esther was a senior, the boys had left town, and she had to grow up really fast, managing the money and time alone. Somehow she knew enough to get up (alarm clock) and go to school. My days in high school were pretty mild compared to that. Our kids lived a pretty cushy life, too. Getting to school at the two-room country school for the first eight grades was always a high priority. We went to school by whatever means of transport used at the time—car when the weather permitted, or horse and sled in the winter when the roads were not plowed. When we were a little older we drove horses with buggy or sled much of the time. The neighbor boys, Charles and Galen Bowerman, were learning auto mechanics at an early age, and their family had one or more Model T Fords which the boys kept running and gave us many rides to school. The schoolhouse was not only for school, but served as the only center of activity for the township. Neighbors had many fall and winter parties where everyone played cards, usually whist, until eleven or so. Then the women would break out a big lunch of sandwiches and cakes. Finally the fiddle and piano played for dancing until three or four. Whole families came, and kids slept on coats and blankets when they could no longer stay awake. This is Grandma Grace’s version of caramel for rolls. Two things Grandma Luehr knew how to do: tell stories and cook. My childhood memories are full of bread, kuchen, pies and caramel. For many years when I was in high school and college she sold her baked goods through the neighborhood grocery store, Wolf’s Grocery. She made enough money to stay in the house and lead a comfortable life. A family favorite every Christmas was Grandma’s caramel. Everything about that caramel was perfect. The gentle aroma of cooking cream and sugar. The buttery feel of the waxed paper wrappers. The perfect “bite.” Her caramel was never too hard, and never too soft. We’d hold the candy to the roof of our mouth with our tongue, letting it slowly melt into delicious sweetness. 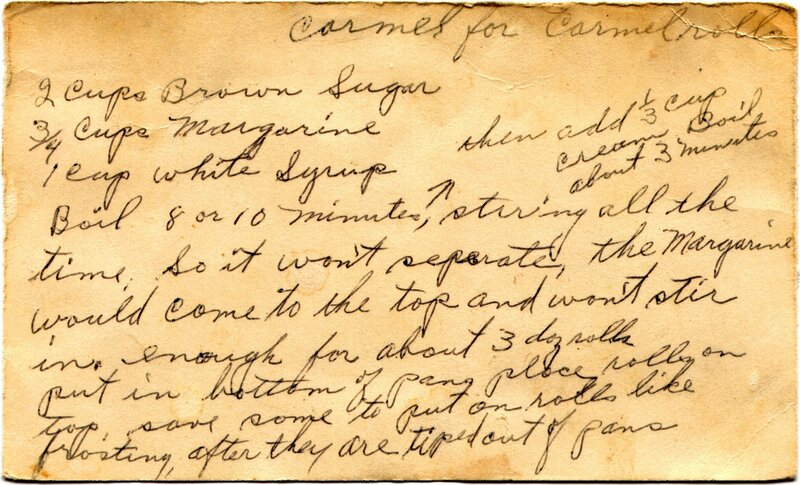 Judy and I have picked up a couple of recipes from Grandma Luehr, and the caramel recipe is my favorite. After Fanny died, Judy would make caramel every Christmas, delighting everyone who came to visit, especially my brothers. One year the recipe failed. The caramel was grainy. The texture was all wrong. We threw out the batch, knowing that we had done something wrong. The recipe requires patience and precision. The next batch was OK. Then we had the same problem the following year. Twice. After a couple of years experimenting we discovered that the dairy industry had introduced a new product. Ultra-pasteurized whipping cream. The new cream did not work for caramel. We had to carefully look for old-fashioned heavy whipping cream, which worked perfectly. We still enjoy Grandma’s caramel every year. Grandma knew how to run a business: Focus on good product. She never made a pile of money, but her customers and children enjoyed the fruits of her labor. The stories of the depression are probably not exaggerated, but somehow I always felt secure. We got to school, were never hungry, and always had clothes to wear and fuel to keep us warm. We did not feel deprived because others we knew had even less than we had. The “dust bowl” was very real. I remember walking home from school through the dust blowing off a bare field so thick it was like being in a black fog. It blew into the houses through every tiny crack. Fence rows were buried by it; and where it was really bad, no vegetation remained on the fields. Grandpa Ted working on his car. My brother Linn and I have been interested in family stories for a long time. Some of Esther’s stories in this blog are from the time he and I spent a couple of days with her, listening to the stories and looking at photo albums. After he and I heard stories from Esther about life on the farm, Linn visited our aunt Iris, wife of Esther’s brother Melvin. Linn wrote down the story as Iris remembered it in 2008. The story about Ted’s last days reminds me of our mother’s last days. Those two stories are among the many reasons I don’t often hesitate to visit a doctor. Not a chiropractor, a medical doctor.